Following a heated discussion about book donations on Twitter over the new year, Barbara Band who is a School Library, Literacy and Reading Consultant and a retired school librarian with many years of experience behind her, wrote this piece for Heart about what do you do with inappropriate donations? and should you have a policy for donations at all? School libraries need to be well-stocked with a wide range of resources for all ages and abilities. 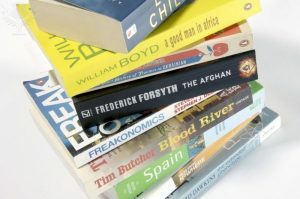 Not just fiction books but also non-fiction to support the curriculum, provide inspiration for students’ interests and exploration of whatever piques their curiosity. School libraries cater for very specific needs, some of these will be the same in every school but each with have its own peculiarities: the curriculum, the interests of students which can vary wildly – a town with a local ice hockey team is likely to have a large proportion of the student body interested in the sport and I’ve worked in schools where there was a huge interest in fishing yet none of my local colleagues reported the same – and every school librarian will have a wish list of specific titles; the next book in a series, a new publication by a popular author, something they’ve seen in a bookshop that will fit in well with the collection. In a time of budget constraints stocking a school library that fits all these parameters can be hard to achieve so donations can be useful. However, I would often find that the donations turned out to be inappropriate, nevertheless I still said “yes” every time somebody said “I’m clearing out some books, would you like them”? Why? Because you never know what gems you might find – after all, one day there may be a Harry Potter first edition that you could sell for vast sums (I wish!). But alongside that yes would be the caveat that the library had a stock selection policy* and that anything that wasn’t suitable would be offered to departments first and then given to charity. I never had a single person say they weren’t happy with that. So how did I decide what to keep? • The first assessment would be on the condition of the book or magazine. Was it in a reasonable state with no sticky substances or pages falling out? Was it damaged or defaced? • Fiction – if it was a popular book then I would keep it for additional copies. If it was something that I didn’t think would be borrowed (for example, where I already had the book with a more up-to-date cover or it was by an author who was no longer read) then I would use it for the “reading boxes” that I stocked in every tutor group or put it in my regular book sale to raise funds for new stock. If the book was recent and “as new” I would consider it for a library competition prize. • Non-fiction – these were assessed for relevance to the curriculum, accuracy and whether they were up-to-date. School librarians struggle to get others to understand that we constantly need to weed our stock. As librarians, our task is to help students find the information they need, to guide them to a book they may enjoy, and the ultimate aim is for students to become readers for pleasure and independent learners, finding what they want without our intervention. We cannot stand over every student and check what they have taken off the shelves – if a student does their homework using an out-of-date library book and gets it wrong, who is at fault? Facts change over time – we no longer have nine planets – and even recipe books have to be treated with caution. Older ones would not give guidance regarding unpasteurised products and pregnancy. • Basically any book I added to the shelves from donations had to supplement or enhance what I already had. After that, any surplus fiction that I didn’t want I would pass to the English department for their classroom libraries although rather than dump piles of books on them, I’d catch staff when in the library and ask them to look through them. • Likewise, if there were any books that I felt would be useful to the SEN department (fiction and non-fiction) then I would pass on these too. • Non-fiction books would be distributed to relevant departments – again, I would remove anything that was horrendously out-of-date or in poor condition. Departmental libraries are different from the school library. Teachers are able to direct students towards particular chapters where the information is still relevant, for example, the section on gravity in a science encyclopaedia is unlikely to date whereas information about space travel would need to be checked. • Some books, whilst not suitable for any of the above, could still be used – for papercrafts in the library, as backing paper for quotes, I’ve even used falling-apart graphic novels to create bookmarks (the Simpson’s ones were very popular!). • The (hopefully) diminishing pile left would be taken to a charity shop – I know my local one collects books not suitable for sale and sells them for pulp so I feel that not only am I helping the charity but also the environment. However, there were always some books which wouldn’t even be suitable for this so those would be put directly into the recycle bin. School libraries have limited space and each book needs to “earn its keep” on the shelves; keeping old and tatty books in case somebody might want to borrow them means no space for the new books. I’ve weeded sections before and been asked by students and staff whether I’ve bought more books – the old stuff hides the new! School libraries also rarely have store rooms so books that are removed usually have to be disposed of and we can’t stock a book on every single possible thing we may be asked for. Do continue to think about your school library when donating books but please don’t expect them to keep everything and maybe have a sort out of them first to save the librarian that trip to the charity shop?